An agreement announced this week for Norwegian-financed trade between Norway and Iran has received mixed reactions. While it may help create jobs in Norway’s hard-hit oil and gas industry, human rights organizations worry it may lead to conflicts of interest. Eksportkreditt Norge and GIEK signed a Memorandum of Intention with the Export Guarantee Fund of Iran and the Organization for Investment Economic & Technical Assistance of Iran that will enable as much as a billion kroner (USD 1.2 million) worth of new economic cooperation between Norway and Iran. “We want more trade with Iran and better market access for Norwegian business,” said Norway’s Foreign Minister Børge Brende, who was in Teheran this week for meetings with Iranian officials. 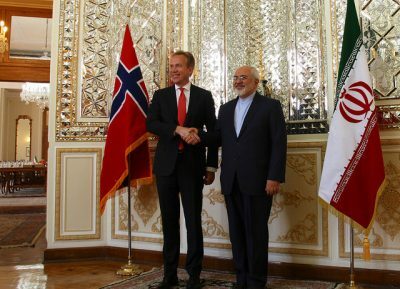 Brende said the deal is aimed at making it easier for Norwegian firms to export goods and services to Iran, which he said is especially interested in Norwegian technology and expertise, not least in the oil and offshore sector. While some Norwegian officials hailed the deal as helping to create or secure Norwegian jobs, human rights organizations were skeptical. They referred to the high rate of executions in Iran, limits on freedom of expression and the press, and discrimination against women, and warned that Norwegian policies and values must not be sacrificed undermined for the sake of business deals.